A Drexel student signs out one of the MacBooks. 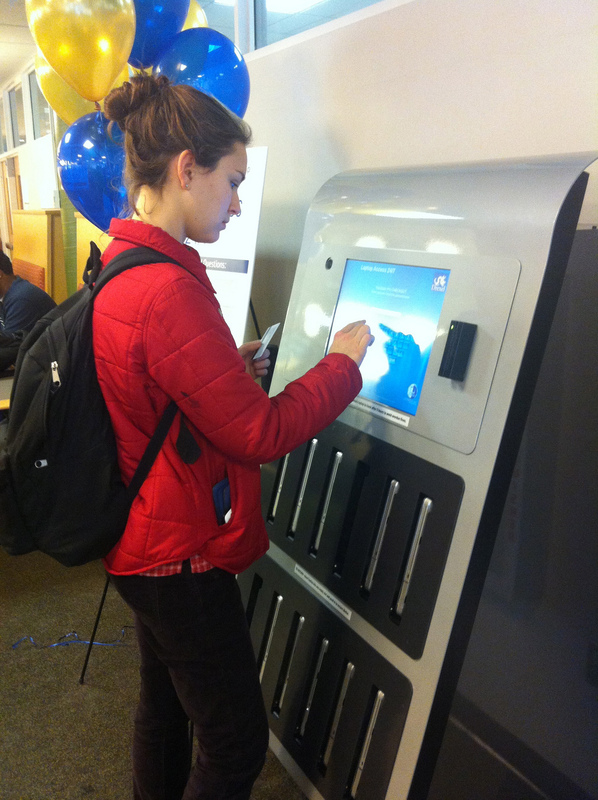 Providing a solution to students who don’t want to carry a laptop while walking late at night from their dorm or off-campus housing to the library, Drexel introduced a 24-hour, self-service kiosk located in its Hagerty Library that will dispense MacBooks to students, faculty and staff. Drexel is the third university on the East Coast to introduce the vending machine, which holds up to 12 MacBooks that could be checked out free by anyone with a Drexel ID for five hours of use. Update on Feb. 12, 2014: After a successful year of lending MacBooks, Drexel has added an additional 18 laptops to the vending machine bringing the total number of available laptops to 30. I don’t want any company/university to track all of my work and communication. login data / passwords for things like dropbox could easily be snatched. I don’t know the details on how it’s done but all information is deleted once the MacBook is inserted back into a slot at the kiosk. Adding to Niki’s comment, you have to sign in using your student ID (against which you’re issuing said MacBook). And once you sign out, or do a Standby/Shut Down/Restart it does a full wipe. So even if you log in using your own account a second time, there’s no trace of previous data. This holds for applications that you might have installed (there are restrictions against those too) get wiped, along with their data. So stuff like Dropbox, along with other login information are handled pretty well. Please capitalise Ipads as iPads! Thanks for pointing that out. I corrected it. interesting idea. I could see it going one of two ways: 1)Smashing Success. 2)Wait, theft is a thing?!? Being that it is a University and they have to swipe their IDs, I would imagine a nice hefty bill would go on their student account if it walked away. They know who took it. It wouldn’t work that easily elsewhere, though. The security in Hagerty is pretty intense, though. One probably can’t walk out of the library with something they shouldn’t be walking out with (I’m guessing the items, be it books or laptops, are tagged because there are scanners at every door). it resets any changes made on the Machine to a predefined Setup, which takes less time than a Re-Imaging.